1. This presentation is a basic introduction to many of the topics and themes that are represented throughout the curriculum. 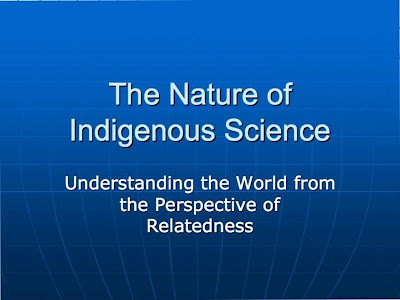 In it we lay out the basic premises and explore the way in which Indigenous studies of nature characterize the natural world and provide a way of understanding and knowing that is complimentary to, but different from, concepts emphasized by the Western Scientific tradition. We want to emphasize here that we do not think it is necessary to have Indigenous knowledge and understanding of nature be validated by Western approaches. 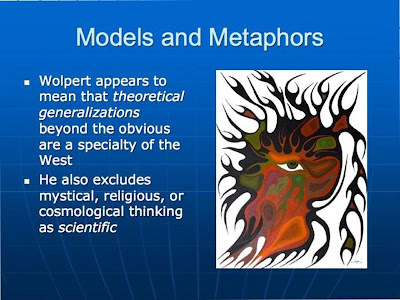 The important theme is that at times Western and Indigenous knowledge may come to similar conclusions, but these are reached through different philosophical traditions. 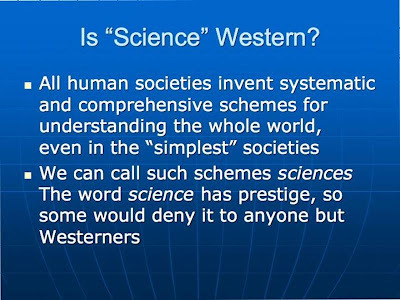 Thus Indigenous science (knowledge) is equally sophisticated and can yield results that are more insightful. The Yupik scholar Oscar Kawagley has written that: "Such a narrow view of science not only diminishes the legitimacy of knowledge derived through generations of naturalistic observation and insight, it simultaneously devalues those cultures which traditionally rely heavily on naturalistic observation and insight." 3. 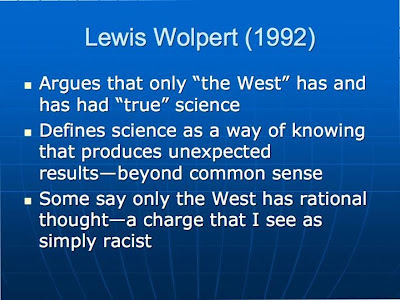 Lewis Wolpert is an author, broadcaster and professor of biology as applied to medicine in the department of anatomy and developmental biology at University College London, UK, where his research interests lie in the mechanisms involved in the development of the embryo. Born in Johannesburg in 1929, he originally trained as a civil engineer but changed to research in cell and developmental biology at King’s College London in 1955. In 1966 he was appointed professor of biology at the Middlesex Hospital Medical School. He was made a Fellow of the Royal Society in 1980 and awarded the Commander of the British Empire in 1990. 5. This is a wonderful pedagogical tool. 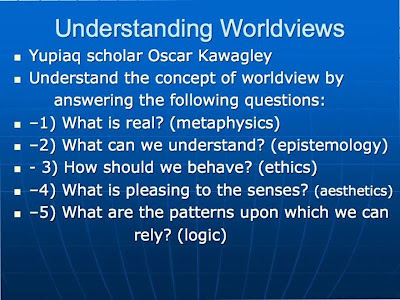 Using a class discussion to discuss these 5 points can produce a good deal of understanding of the concept of worldviews and how they are constructed. 6. A clear example of this difference can be seen by comparing these metaphors from different traditions. 7. 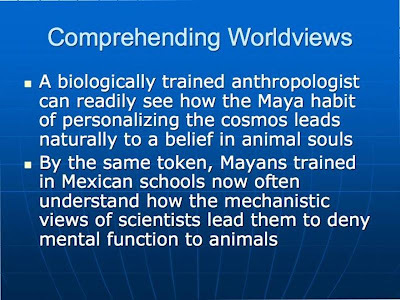 It is possible to reconcile these different approaches and worldviews, but it requires respectful dialogue and careful understanding of other worldviews. An example can be seen in the account of an early encounter of European missionaries and Indians in North America. The missionaries tell the story of Jesus. After they finish, the Indians tell the missionaries their own creation story, which involves the origin of corn. The missionaries respond angrily, saying "We have told you the true word of God, whereas you respond with a fairy tale.' the Indians are offended and respond, "We listened to your story with respect, why can you not listen to ours in the same way." The irony is that the story of the origin of corn is probably closer to the truth because it is almost certainly a metaphoric interpretation of an event that was experienced in the history of the tribe, whereas there is considerable controversy, evenb among Western scholar of the facts of the life of Jesus. 8. 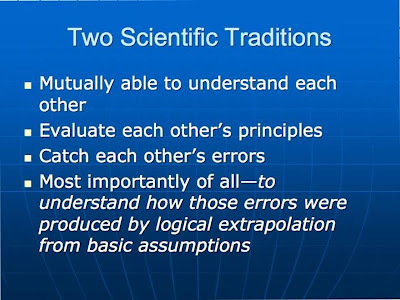 IF things work effectively individuals both both traditions should be able to engage in an effective dialogue. The Salishan scientist Lilian 'Na'ia' Alessa has argued in her essay What is Truth (Alaska Native Reader pp 246-251) that Indigenous traditional knowledge is also tested, and that refutation of such knowledge is "not the ridicule of one's peers, or failure to get a research grant, it is sickness, suffering and death." Thus understanding the natural world and how it works are a matter of survival. 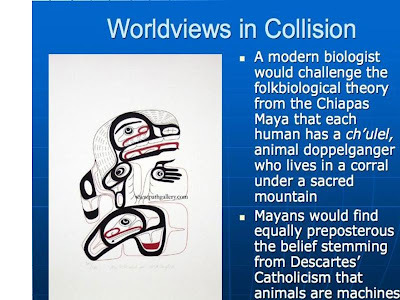 Dr. Alessa's essay is a wonderful discussion of how an Indigenous person trained in Western science has come to terms with Indigenous ways of knowing and understanding. 9. Such Western traditions originated in the Renaissance of the fourteenth and fifteenth centuries, which emphasized absolute human autonomy (Coates 1998, Nature, Univ. California Press). The seventeenth-century scientific revolution did little to change this scenario; in fact, it actually made the situation worse by "transforming nature from a living organism into a machine, simple, unfeeling, inert matter with no intelligence, soul, or purpose and the new mechanistic philosophy assisted the commodification of nature" (Coates 1998: 68). The 18th-century "Enlightenment" stressed that humans were masters of their own destinies and emphasized the subjugation of nature (Coates 1998). The Europeans who emigrated to North America during the seventeenth and eighteenth centuries were disciples of this cultural, philosophical, and intellectual tradition. 10. 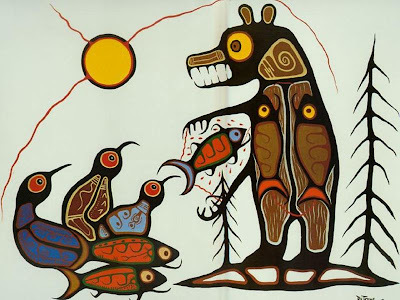 One method that can be effective is showing the students an image like this painting by the Anishinaabe artist Roy Thomas. 11. 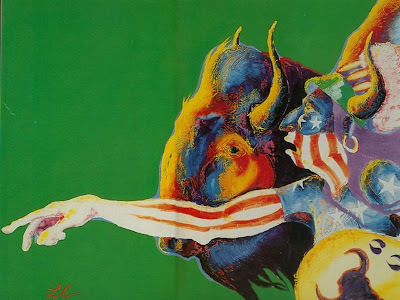 It is important to emphasize that Indigenous Americans are not that different than other human beings, except that they seem to take the concept of responsibility as a cultural norm more seriously than do most cultures. Because they look at Nature directly, they understand relationships in a more personal fashion than is generally accepted in contemporary Western thought and understand the functioning of natural systems in terms of relationships. 12. 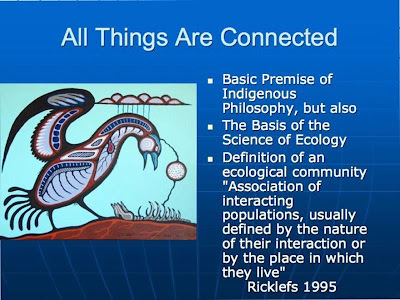 Acknowledgment of relationships among the organisms that share a habitat or an ecosystem can be expressed in terms of connections. 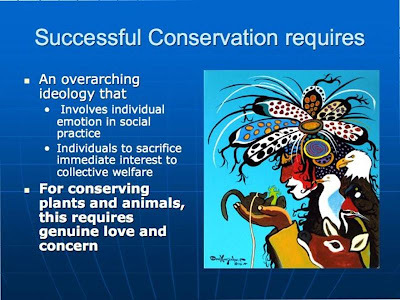 When humans feel that they are linked to nonhumans and feel that the lives of others have meaning they behave much more carefully and don't take lives or destroy habitat solely for the benefit of humans. 13. 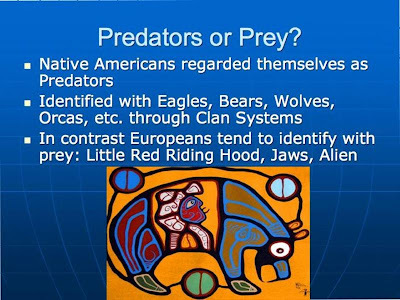 This is an important point that often goes unrecognized in discussions of Indigenous knowledge, but it is very clear from their stories and their ceremonies that Indigenous peoples considered themselves to be predators or hunters. 14. This image, titled Eagle Brother illustrates the connection that many Indian people feel with predators. In this case the Golden eagle and the human are shown to be strongly connected. It might be noted that Euro-Americans also use the eagle as a heraldic symbol, where it appears on money, being on the back of both the one dollar bill and the 25 cent piece. 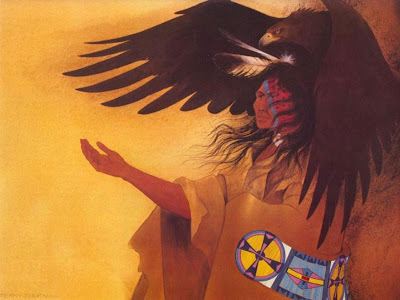 Although this is not often emphasized, in many Indian works of art they use the Golden Eagle, which is the top predatory bird of the great plains and west, rather than the Bald Eagle, which is primarily a fish-eater and scavenger that lives alongside large bodies of water. 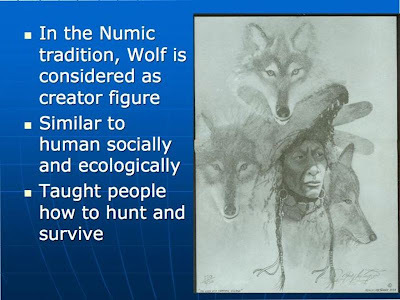 In the Shoshonean (Numic) peoples, which include the Shoshone, Paiute, Ute and Comanche, Wolf was regarded as a Creator figure and the name for Gray Wolf (Numuna) is similar to the name the people use for themselves. 16. 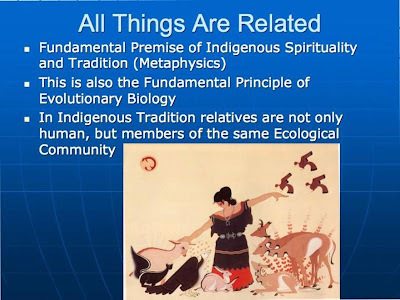 A concept which typically is linked to the idea that All Things are Connected is that All Things are Related, which is a basic premise of Indigenous metaphysics. This can be seen in the prayers and rituals of many tribes that include the phrase, "All My Relations." 17. 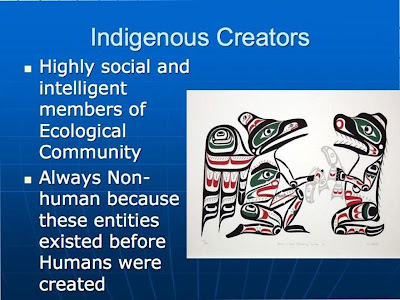 In Indigenous thinking species that are very like one another in the way they live are close relatives. This concept emerges from the idea that the natural world is based on relationships. 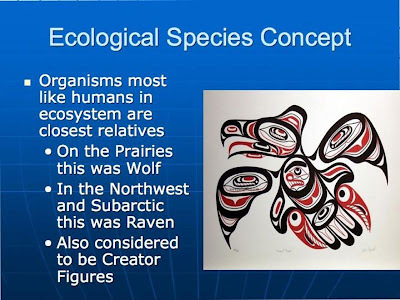 Examples are Raven in the Pacific Northwest and the Arctic and Wolves on the Great Plains. Each of these species is instrumental in assisting in hunts or in teaching humans how to hunt effectively. 18. The concepts of creators and creation always seem to be hot topics. In the Western tradition these topics are usually dealt with only through religion, which relies on the supernatural. Ironically, classic taxonomy, with its emphasis on "type specimens", which are related to the concept of Platonic "ideal forms" have provided fuel to the creationist fire. 19. 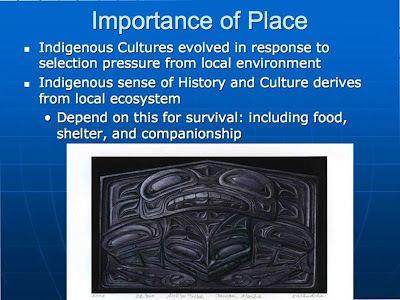 One thing virtually all scholars and Indigenous peoples agree on is the importance of local place in the formation of cultural traditions. In many traditions, such as this carved panel, place is represented by showing the local species. The top portion of the panel pictures the mountain behind Aak’w Lake, the presence of the wolf in the center and the dog salmon, in the lower corners, that return to the lake every year to spawn and die. The Tlingit are part of two distinct family groups - the Eagle and the Raven. The primary clans of the Aak’w Tribe are the “Woosh-kee-taan” (Eagle/Shark) and “Tl’ei-neidi” (Raven/Dog Salmon). By Wanda Culp. To learn more about this artist click here, if you want to read the story with the image, go to page 6 of her website. 20. 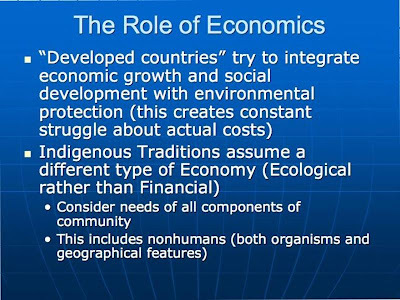 How does it change the way you see the world to think of humans as relatives rather than as resources?